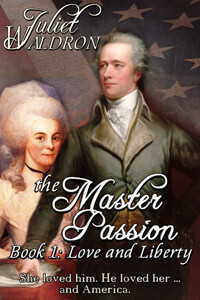 The Master Passion is the story of our brilliant first Secretary of the Treasury, Alexander Hamilton, and his wife, Betsy Schuyler. It begins with their Revolutionary War courtship. Although born poor and illegitimate, as an Aide de Camp to General George Washington, Hamilton dares to reach, boldly pursuing Betsy, daughter of a wealthy and prominent New York family. Betsy’s passion is Alexander. Alexander’s passion is America. Though Hamilton’s financial acumen and political courage is crucial to the formation and survival of our nation, his star sets quickly. Disillusioned, political power broken, his adored eldest son killed in a duel, Hamilton goes to his own famous duel with Aaron Burr in the spirit of those noble Romans he so steadfastly admires, preferring death to dishonor. The Master Passion places the battles of Alexander Hamilton, the lonely idealist, within a family saga rich in period detail. The great edifice for which he laid the groundwork–America–has become, exactly as he planned, the richest and freest country on earth. “There’s naught canna be dune noo! James Hamilton, his long face flushed, roared the words. Scots surfaced whenever he was angry. Silenced at last, Rachel crumpled to the floor, sobbing. Her once gay calico dress, muted by many, many launderings, lapped her. The under shift, always scrubbed to a sea-foam white, drifted from beneath. A candle shone in the balmy West Indies night. The voice wasn’t unkind, just drunk and hurried. From outside came the bell-chorus of an untold host of peepers. Alex and Jamie, in shirts too ragged to wear during the day, had been asleep in the only bed. There was a mattress filled with palm fronds in the next room upon the floor, but this time of year scorpions came in. When Mama hadn’t returned, they’d decided to sleep in the greater safety of her bed. Jamie groaned, sat up and rubbed the sleep out of his eyes. The Captain of the Guards, Mr. Egan, leaned over. He breathed rum and seemed unsteady. Behind him, supporting herself on the door frame, was Mama. She was, Alexander noted with a thrill of disgust, bare-shouldered, her cap removed, her shining dark hair loosened. Neither boy replied. She didn’t want an answer. What she wanted was for them to leave. Tomorrow she’d give them a scolding, but not tonight. At the moment there were other, more important things on her mind. “Here, young fellow.” Egan, muscles rippling beneath his shirt, handed Jamie the candle. Obediently, Jamie took it. Their rooms were, after all, rented space in the front of his house. He threw a grin at Rachel, who was restlessly tossing a dark curl over a pale shoulder. Mrs. Lavien or Mrs. Hamilton—whichever name she used now that she was living alone with her sons on St. Croix—was almost thirty, but she still turned heads whenever she passed along Christiansted’s bustling main street. Anticipation caused the captain to deliver a slap on the rear to speed the smaller boy along. “Don’t you touch me!” Alex spun and glared, his thin face white under coppery curls. Alexander was wide awake now, his eyes blazing blue fire. The distant echo of surf, the sighing palms, the intoxicating fragrance of Lady of the Night that climbed in profusion over the house, held no power to still his pounding heart. Grinning, Egan stepped back, threw an arm that was infuriatingly proprietary around his mother. “Yes. Don’t start,” Rachel cautioned. “Just mind your own business and go back to sleep.” Her dark eyes turned toward Egan. One hand moved easily across his chest, taking in the feel of hard flesh beneath. Alexander wanted to kill them both. “Come on, woman.” Egan terminated the conversation, pulling her playfully through the door into the darkness. In the next room, the boys busied themselves in a thorough inspection of their mattress. Satisfied at last about the absence of scorpions, they extinguished the candle and lay down together. From over the transom came whispered laughter and the sound of the captain’s boots dropping to the floor. In the soft darkness, beside his now stolidly motionless brother, Alexander crammed fingers tightly into his ears. Tears pooled against his cheek. “You aren’t bastards, you know, no matter how many say it.” In their room over the store, Rachel sipped at her glass of rum and gazed out the window. Jamie rolled his eyes at Alex. Here it came, the nightly monologue. And what difference did their innocence make, anyway? Jamie knew there was no escape. Rachel smiled crookedly, drained her glass. The man she’d been expecting hadn’t appeared. It had left her melancholy. Rachel frowned, stared at the ceiling and twirled a dark curl meditatively. By now, Alex knew mother was already very, very drunk. Inwardly, he shrank. Fat bugs circled the oil lamp, creating a dizzy pattern of light and shadow. The space held their mother’s bed, a wardrobe, a hulking sea chest, a table and three chairs. Sometimes it was a pleasant place to be, for the high windows of the room caught the prevailing breeze. In this part of Christiansted, though, where there were taverns and whorehouses, it was best to be above street level at night. A roaring sea shanty began in the inn a few doors down. Jamie’s head swiveled toward the sound in a gesture of impatience. He wanted to be away, out on the street with his friends, but Rachel was still busy with recollection. Into the pause that followed, tree frogs shouted. The relief their neutral chorus provided was broken by drunken laughter from the street below. Inwardly, Alexander damned those sailors. They seemed to mock his mother’s painful story, the one she couldn’t stop retelling. Across the table, his older brother maintained an expression of studied disinterest. He’d heard it a thousand times. Alex knew that Jamie had plans to meet his forbidden friends, that “bad company” he just naturally seemed to prefer. The red-necked customer scowled, but Alexander held the package tightly to his skinny chest and stared up steadily at the man towering over him. He was only ten, and small for his age, but there was not so much as a flicker of fear in his blue eyes. The money was due. The money was for Mama. Alexander toted the difference and handed over a receipt. “Thank you, Mr. Inness, sir. I’ll look forward to the rest on Friday.” His manner was differential, but his tone was not. When the customer left, muttering and shaking his head about being pushed by a child, Alexander went straight to the ledger. No new customer came, so he climbed onto the high stool and began working at the figures. Jamie had slipped out earlier. He was probably down at the docks by this time, hanging around with the thieving, gambling idlers he called friends. Alexander routinely covered for his absences. He didn’t miss his brother. Jamie was a nuisance. He gabbed too much with the customers, never asked for money and never wrote things down. Some months passed. Jamie was apprenticed to a carpenter on the other side of the island “for his own good.” Just after, a fever swept through Christiansted. Rachel caught it first, then Alexander. In their upstairs room, Mother and son tossed on the same bed, tended feebly by old Esther, the only slave not rented out. The surgeon came, bled Rachel, and gave her medicine. Two days flowed by in a throbbing, aching blur. Both patients were drenched in sweat, always thirsty, skin on fire. Alex didn’t know how long it was that he and his mother lay in that bed. The passing of a day was signaled by the reappearance of the surgeon to bleed Mama, the hours by Esther. Humming softly, whispering prayers to the many gods she knew, Esther would sit beside the bed and patiently spoon chicken broth or some cold, bitter herb tea into their parched mouths. Day and night spiraled; the doctor appeared to give Rachel an emetic. For the first time, he bled Alex, too. Mama had been tossing and moaning, but, after a long spell of vomiting, she’d grown quieter. A kind of rattling came with each breath. Alexander, aching and shivering, drifting in and out, didn’t mark the moment when the sound stopped. In his fever, unable to move or speak, the pool of urine in which they lay felt strangely good, comforting. Esther’s withered, weeping black face materialized for a time and then disappeared. Next, the doctor and two Danish officials arrived. They began poking around, picking up ledgers and opening drawers. Alex tried to protest, to order them out, but only a kind of murmuring came. The fever sat like a giant on his chest. Alexander struggled to rise, but he couldn’t. Alexander tried to push himself upright, but everything disappeared as soon as he lifted his shoulders from the pillow. The pale yellow room and everything in it flowed. The pain in his joints, in his head, was shattering. Alexander now had an idea that he, too, woulddie. The black obediently gathered Alexander up, then, without ceremony, dumped him onto the palm frond mattress on the floor. Movement was agony. Blackness rushed him again. “Don’t look like he goin’ to last.” The same fat, unsympathetic face stared down, a face familiar, although Alex couldn’t summon the name. Afterwards, Alexander believed it providential, the flash of rage which coursed through every fiber of his weakened being. Fury pulled him back from the brink. Alexander gazed at her, now neatly laid out in her best dress on a board set between chairs. She seemed peaceful now, and she had not been that way often. Rachel had been a restless beauty, her last years spent in an almost continual state of helpless rage. She is quiet now. Nothing can trouble her. There will be no more failure and betrayal. Alex shuddered. From now on, he must take care of himself. All that was left in the wind of a hot St. Croix afternoon was Mama’s pitiful, ripening husk. Her family buried Rachel in the Lytton family graveyard. Although they—aloof from their black sheep—had done nothing to help when she’d been alive; in death, they reclaimed her. Much of the small estate was used up by the fancy funeral old Uncle Lytton insisted upon, although one useful thing came from it. James and Alexander got the first shoes and stockings they’d had in years. On the day of the burial, Alexander forced himself to walk, dizzily clinging to his brother’s arm. Beneath the pounding sun of an upland plantation, the windy roar of a cane-field ocean in his ears, he and his brother wept. Beautiful Rachel, who had rocked them, who had taught them, who had loved them and shamed them—Rachel was gone. When Alexander learned what the court had ordered, he ran through the crowded streets of the town, past the pastels of the stucco row of stores, past the colonnade. Weaving like a madman, he ran across the paths of carriages and around erect, brown women with loaded baskets on their heads. Bare feet down the road! Slaves, sweating, glossy blue-black, turned their heads beneath wide brimmed straw hats as he plunged past a chain gang on the road. Finally, he crashed into the palm fringe of the beach, startling the mulatto women who were resting in company with a crowd of goats and children in the slanting shade. At last, feet stinging from the cuts sustained on the road, Alex hit the burning, too soft sand of the upper beach. He twisted an ankle, but he didn’t stop. Reaching the harder, wet sand where the waves came and went, he took up a quick stride. Only when his chest was on fire, and when he felt certain no white person would see him, did he fall to his knees in the sugary, wet sand. There was a fierce onshore wind. Breakers exploded over the reef. At last he could cry as loudly as he wanted, in a place where his helplessness, his weakness, would only be witnessed by the thundering sea. “Everything Mama and I worked so hard for, every coin we struggled to make! This devil out of her past appears and the court hands it all to him. To a son she gave away!” Long tongues of sea licked the beach. As the wind rose, it started to rasp an ever-deepening gully into the gravel. Although now at the edge of an ever-deepening trench, sun burning through his skin, Alexander did not move. He almost wished a big rogue wave would roar in and carry him away. The air filled with flying spray and driven sand. Alexander’s hair stiffened with salt. Each gust threw a prickling, sticking handful against his tear-stained, sweating face. Alexander carefully closed the heavy ledger. Though he was barely half finished, it had already been a long, long day. Numbers swam before his eyes. He rested his head, those tight fine curls, upon it. Louvers were angled against the sun, but the heat of a heavy, thunderous summer afternoon invaded the room. No one would come into Mr. Cruger’s Store for some time. It was after dinner, siesta for the Spanish and Portuguese—and for anyone else with half a brain. His gut was puffed with breadfruit and fresh fried flying fish—a delicious dinner for the staff today—and he had stuffed in as much in as he could hold. Tomorrow, it would be back to the usual gooey salt fish plopped onto yams or rice. Now, the effort of eating so much, the work that had begun for him in the store before dawn and the muggy heat of tropical August weighed him down. Part of a long row of two story pink stucco buildings flanking the Christiansted square, it had a high ceiling, a sheltering verandah beneath a colonnade and tall windows. The store stayed nearly cool in the morning. Nevertheless, by 2:00 p.m. the room was almost as hot—and far stuffier—than the sun-blistered sand outside. Beyond the door, nothing moved. No immense casks rolled by sweating blacks, no oxen, heads swaying, pulling an endless train of high sided, lumbering wagons. No planters in carriages with their ladies—fancy and otherwise—no heart-rending lamentations from the slave pens or shrieks from the public whipping post. No drunken sailors and their whores, seeking shelter for negotiations in the shade. Only gulls stirred, wheeling and shrieking, making an incredible din. Alex knew they swarmed behind the building, fighting over refuse the cook threw out. The sea, always moving, rising and falling, dangerous and alluring, could be smelt and heard, the fence that kept him in. Perhaps, someday, it might become a highway to the greater world, a world of which he continually dreamed. His work area was a standing desk with a decided slant. The ledger rested on a narrow tray at the bottom; the wood was ink stained and grimy. Readjusting himself so that he was secure on his seat at the high stool, Alexander looked down at his own bare calves and feet, dangling high above the broad, saw-dusted planks of the floor. On every side, crammed in around him and around the counter, were casks and barrels of every size. Some contained Irish butter, some salt pork or salt cod. Others contained flour, keg bread, cornmeal or rice. Bohes and Congo tea sat in canisters. Yard goods, a rainbow of color, were piled on one counter and laid away in long pigeon holes which occupied most of a wall. Kitchen utensils and jars of green or blue containing medicinals occupied another shelf. Pipes of Madeira, hams and barrels of Virginia tobacco shouldered in the cool, constant temperature of a stone cellar. In a long warehouse area at the back of the store was stacked white pine from Albany, Georgia pitch pine, white and red oak staves and headings, along with casks of hinges, hooks, and spouts. Behind the counter, another servant lay sleeping, his snores practically rattling the lids from the apothecary jars. Alexander knew he should be taking advantage of this time and resting, too, but he was too skinny to risk the floor and the irate toe of a rum-soaked planter’s boot if he overslept. The last time that had happened, his ribs had ached for weeks. Someday, he thought, I shall sail away from here. I shall make my fortune and live like a gentleman. I shall have silk stockings and shoes with silver buckles, and ivory buttons on my vest and upon my knee breeches. As I go about my business, people will politely and respectfully lift their hats to me, the way they once greeted my father, in that long ago time when our family lived at Nevis. Ned, my Ambition is prevalent that I contemn the grov’ling and condition of a Clerk or the like, to which My Fortune etc. condemns me and would willingly risk my life tho’ not my Character to exalt my station. I’m confident, Ned that my Youth excludes me from any hopes of immediate Preferment nor do I desire it, but I mean to prepare the way for futurity. I’m no Philosopher you see and may be justly said to Build Castles in the Air. My Folly makes me asham’d and beg you’ll Conceal it, yet, Neddy, we have seen such Schemes successful when the Projector is Constant. I shall Conclude saying, I wish there was a War.